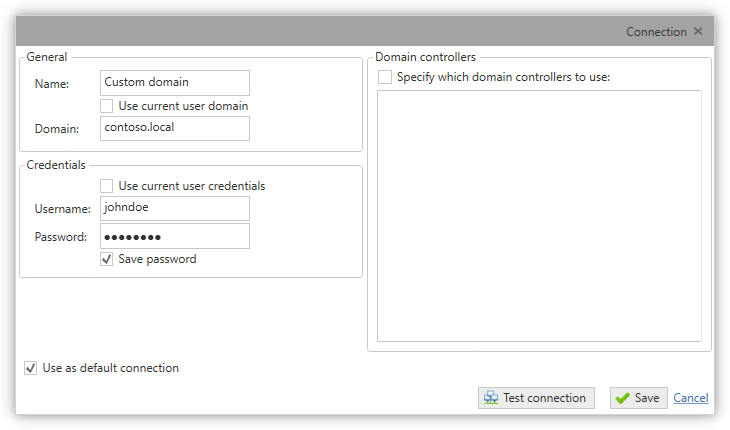 Search and manage user and computer accounts in your Active Directory domain. Keep it up-to-date and clean up inactive accounts with a range of actions such as disabling, moving to different organizational units and removing from groups. You can also manage the active accounts in your domain, with the filters enabling you to find the accounts you need quickly and easily. AD Administrator enables you to obtain the most accurate last logon time by iterating all domain controllers and calculating the real last logon time. You can configure how the last logon time of the account is obtained - the most accurate method (obtaining data from all domain controllers) or the quickest method (using the lastLogonTimeStamp replicated attribute from one domain controller). Perform actions for multiple accounts simultaneously. Simply select all the accounts for which you want to execute an action and press the required action button. You can export search results from AD Administrator to three formats to suit your requirements - CSV, Excel (XLSX) and HTML. Windows operating system starting from Windows Vista SP2 and above (including Windows 10 and Windows Server 2016). Microsoft .NET Framework 4.5 and above.